Opinion – Vendors Please Stop the Mud Slinging! At first it seems a bit cute and funny. Oh look! It’s Star Wars! All nerds love Star Wars! I do too, just to be clear. What this kind of marketing does though is to dumb down the customers. It insults my intelligence as a Network Architect. Hardware still matters. There still is a physical world. Almost all projects in networking has some kind of existing network so almost all deployments are going to be brownfield to some extent. Please show me the organization that does not have an existing network and is going to deploy something like NSX or ACI for their first network. Please show me the organization that has no legacy systems or applications. Please show me the organization that develops and owns all of their applications and they are all nicely coded and don’t require any L2 adjacency. Yes, there are these companies. They are called Google, Linkedin, Facebook etc. and they live in another world. Those companies are however not interested in products like NSX or ACI. 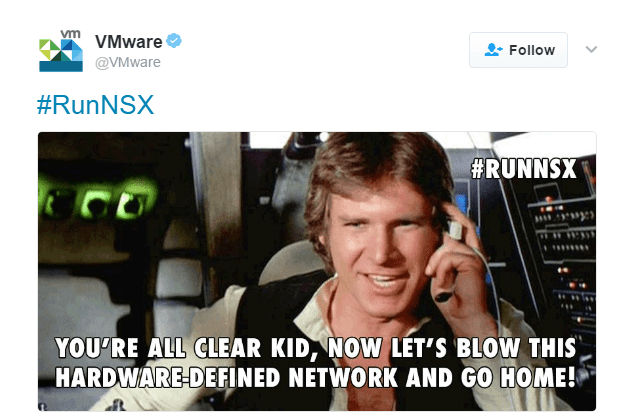 I’m not only blaming VMware here. There are many companies doing this. They put out marchitecture, FUD about other products and get involved in mud slinging. Someone tweeted that “You can’t expect marketing to know tech.”. I’m sorry but that’s definitely what I expect. Otherwise these people can find a job somewhere else if they aren’t interested in tech. They don’t need to know as much as a Network Engineer but they do need to understand what they are selling, what their product is good at, the use cases of their product and how to integrate their product with other products and networks. It’s 2017. People are well educated, smart and have access to a wealth of information at their fingertips. Slinging mud just isn’t a good marketing strategy. Network Engineers are redefining themselves, always learning, always trying to improve themselves and marketing still puts out things like this in 2017. Sales and marketing definitely need to up their game. As my CEO said the other day: “Business is not between companies, it’s between people”. This is exactly what it’s about. If you burn my confidence by putting up stupid stuff on social media, it will affect your sales. Endorse your product on its own merits. Don’t talk down other vendors. This only makes YOU look bad. Hopefully someone responsible for the vendor Twitter accounts reads this and gets an a-ha moment because people deserve better than this. Some days, just keeping marketing from breaking your website is a challenge.